I live with two males. Two males that would eat pizza every day. Every. Single. Day. I do enjoy pizza, don’t get me wrong… but not like my two guys. So I was excited (well, my husband and son were excited), I was very happy though, to try out Pillsbury’s new Artisan Pizza Crust with Whole Grain, recently. I love whole grain breads and doughs, and having a whole grain pizza dough ready to use, made having pizza night so much easier. And I love quick and easy. Most importantly though, I love good taste. 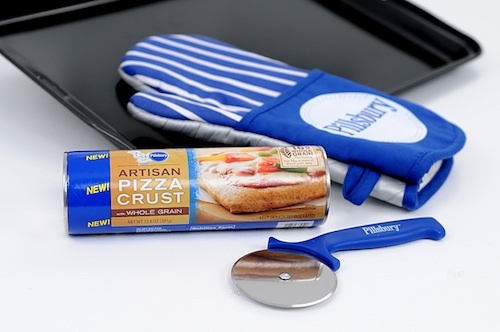 Pillsbury Artisan Pizza Crust fits the bill. It is so delicious. My hubby and son both LOVED it! They didn’t even notice it was whole grain. And did I say, “Easy?” You just pop open the dough, spread on a baking sheet, spread on your sauce, and add toppings. Ta-Da! That’s it. Within 20-25 minutes from start to finish, you’re eating a hot, fresh, delicious pizza! I’ve already bought more of it, and you can download a printable coupon for $1.25 off one package of Pillsbury Artisan Pizza Crust with Whole Grain today! Find out more great Pillsbury products and info at Pillsbury website, and be sure to “like” Pillsbury on Facebook and follow Pillsbury on Twitter. Open to US ONLY. Giveaway ends September 10, 2012 at 11:59 pm EST. Enter on the Rafflecopter form below. Good luck! Disclosure: The product, gift pack, information, and additional sample have been provided by Pillsbury through MyBlogSpark. All opinions are 100% my own and may differ from yours. i will use it to make pizza on the pizza stone that we have i think that would make a great pizza or i would love to try some grilled pizza on the outdoor grill because that might be fun! I love making breakfast pizza. With this house, breakfast foods are game at any meal! I would make pizzas with my kids!I love to cook with them! I would use this to make a pizza roll. I’d roll out the dough, fill it with whatever toppings I have on hand, roll it up, then cut it into pinwheels with the pizza cutter, and bake. It would make a nice handheld appetizer. I plan on making a loaded pizza, letting it bake as the delicious smells travel from room to room around the house, enticing all to come to the table! At the table will be a beautiful salad filled with all the colors of spring, some homemade dressings, and cut up watermelon and cantelope to enjoy while the pizza finishes cooking. When the pizza is done, I will put it on the table for the eyes to enjoy while it cools a couple of minutes before cutting. Then it will be time to savor the most delicious part if the meal!! Loaded Pillsbury Artisan Pizza Crust with Whole Grain!! Yummy!! I would use it on the weekends when my stepson is here. My toddler and stepson are crazy about pepperoni pizza. We could make it together, sit at the table and have a nice family meal. Our kids love pizza turnovers! my kids love playing pizza parlor when we make our own. good times and memories! I would get everyone into the kitchen to help make the pizza! I’m moving soon so this would be cool for one of the first meals in my new place. I plan to use Pillsbury Artisan Pizza Crust with Whole Grain to bring the whole family together by making homemade pizzas!! 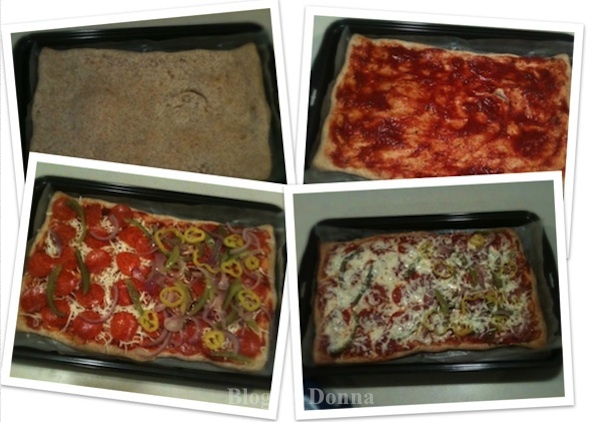 I will make several different pizzas with different toppings, so I can please each different familhy member!! A night to enjoy!! We love BBQ Chicken Pizza, so we would enjoy making a homemade version together! Make them and then enjoy them while playing cards with family and friends. When you make pizza, the family will all come running! I would make the pizza with my son and then we would pig out together! I would get all of my kids involved in making the pizza together. I’ll plan a fun family game night and make a chicken ranchero pizza! My husband makes homemade pizza on Sunady nights. This would be great for that. We will go shopping for the ingredients as a family and make the pizza together and then the best part will be setting down as a family and eating the pizza together. My family loves pizza so it’s pretty easy to get them to come to the table when we make it homemade. Thanks for the giveaway! we never make it homemade but i would love love love to start ! i know my daughter wont mind ! Pizza night….mom and dad live next door and they will come over for sure! You know how I would do it…by letting them get creative and making their own special pizza’and Watch a great movie! I will make homemade pizza when we make pizza all the kids like what we are having. My whole family are pizza lovers, so it wouldn’t be hard to get them all around table to eat one. Just the smell alone would bring them to the table. But I’m curious about how they would like a whole wheat crust. Thank you for the giveaway. My family’s favorite, cheese pizza!! A veggie pizza and a good movie for the whole family! We are trying to eat healthier and we love pizza. this makes so much sense and I can’t wait to try it. It would make great football snacks. we’d make a pepperoni pizza! thanks! I would make a veggie lovers pizza. Would be great to let each member top a section the way they like it. One pizza 4 ways! it’s mini pizza night, like mini taco night only with pizza. everyone gets their own toppings and burns, I mean, makes their own pizza. My husband and I would get in the kitchen together and make pizza! My family loves my homemade pizzas. My children are grown with kids of their own. I know if I tell them I’m making pizza they’ll come visit. I would love to have this. I love home made pizza. My daughter makes them a lot. I have not ever tried to make one! a veggie lovers pizza yummy-o! I would make a veggie pizza, we love em! Green pepper, red onion, mushrooms, spinich, lots of cheese, Moz and munster. yummy!! I would use this for a girls night in!! I will make it a family project and the grandkids and I will put together something awesome. My kids LOVE to make pizza so we will probably do that and have a pizza and movie night! Make a pizza at home, I have never tried this, my mom used to and it was always good. I plan on using the kit to make with my kids!! My kids love to help in the kitchen so this would be a great way to have an evening together and they get to make their own pizzas! I plan to have my son help me make pizza by choosing his own toppings and put them on the pizza then we’ll watch a movie together while we eat. I plan on having a pizza and move night with the family. I would make my family’s favorite piza- Pepperoni! They would all come running! All of the adults in the family that are out on their own get together for a meal once a month. If I win this I can bring the pizza! A movie night with a homemade pizza and have some quality family time!! We all would make pizza together. My fiancee usually makes us homemade pizza, but this would be great for the whole family. A delicious home made pizza would definitely get my whole crew to the table for dinner with no complaints! The smell of pizza always brings the teens to the table! I would love to make a veggie pizza with my family. I know we would all love it. I would have both kids help me with this, they love pizza! the meatiest meat lover pizza ever! My kids always have a bunch of friends over on the weekend. This sounds like a healthy way for them to pass time and enjoy a meal at the same time! They can assemble and bake, then enjoy! Thank you for the chance…this is a great giveaway!! I have been wanting to make a pizza that my whole family can enjoy and be part of the making process. Dicing, adding ingredients to the pizza would get my kids involved and want to eat it when its done in the oven. Plus it wouldn’t take much time and that makes more time to be with the family. This looks yummy and I am sure my family and I would love it!!! We love making certain meals together and Pizza is one of those we love to make as a family. BBQ Chicken or Chicken Carbonara Pizza!!! I’d use it to make a pineapple and bacon pizza! My three little girls adore making pizza so this would be an exciting rainy day surprise for them when we’re all a little blue from being stuck in the house lol. I’d let my kids get creative! Usually they like pepperoni & extra cheese, but lately they’ve been wanting to add bacon/sausage/pineapple lol, so it’d be fun for them! Thank you for the chance! doesn’t everybody come for piza—better make two !!! My grandkids love pizza, so I would have them over & make it for them. I would let the kids make their own mini pizzas out of it! I think this is great! We will make a pizza together with our favorite toppings and then sit down to a nice family dinner and maybe play some board games! I would cut the pizza crust in half and make my own pizza, cheese, and let my fiancé make his own pizza, supreme. I have discovered that making pizza is the only meal that we all get involved in. This would be great fun for all of us!!! I love making pizza at home!! This sounds fantastic. I cant wait to try it. We will have a Pizza Night!! We do this occasionally and let everyone create their own ‘signature’ pizza. Then we all try small pieces of each to see which one we like the best. It’s creative and fun, and oh so delicious!! everybody in our family loves pizza and most of them like to eat healthly. So this would be a great crust to try.